A few days ago a rather fascinating reminiscence by painter Bruce Sherratt of the Potteries artist John Shelton landed in the comments box on one of my pages on the Two Roberts, Colquhoun and MacBryde. This site has already pointed to John Shelton’s work in connection with the Roberts (top section, here), while an entire trove of great stuff on Shelton, including a catalogue of known oil paintings among much else, can be found here on Mark Finney’s site. Bruce’s recollections of Shelton’s tutoring of “this gauche, lost son of a coal miner” deserve better than to sit unnoticed on a past page, so I’m also posting them here, below. I was a student of John Shelton from 1959 to 1962, and then went on from Newcastle-under-Lyme Art School to London and Camberwell Art School. John was my mentor and artistic father. John gave an identity and birth to this gauche, lost son of a coal miner who at 15 could do little else but draw. From John I learned about the artists discussed here. Arthur Berry was a figure of mythic proportions to me as a boy growing up in the small Staffordshire coal mining village of Biddulph four miles from Stoke. I used to see Arthur strolling like a mobile statue between Biddulph High Street and Coppice Wood where he lived with his dad in a jet black tar covered hut. Arthur and his dad kept a few pigs in a small sty next to the hut. Arthur was an enigmatic, statuesque figure feared by us boys. None of us knew his name or who he was. I only found out after entering the local art school in 1958. At Camberwell there was an established school style. One was expected to strive to achieve this style, a painterly approach consisting of broad impressionistic brush strokes. Bonnard was held up as the ultimate role model. I was the odd-ball working class character from the North to whom this official style seemed shallow and anemic compared to what John Shelton had showed me, which included everything from the generation of British and other artists based in London during the war years whom you’ve discussed here, to the German Expressionists; Dix, Grosz, Barlach, Kolwitz and Max Beckman. My particular latent psycho-creative adolescent neurosis and talent propelled me directly into the very core of fantasy and surrealism and it’s most authentic purveyors, such as Ernst, Masson, Tanguy, Matta, Victor Brauna and on to their forbears, Grunewald, Durer, Goya and Bosch. John Shelton encouraged and inspired me in all of this while also introducing me to the most revolutionary politically inspired artists in history; the Mexican muralists: Orosco, Rivera, Siqueiros, Tamayo, and the German-Austrian-Mexican surrealist Wolfgang Paalen, who Shelton told me was eaten alive in the Mexican desert by wild dogs. 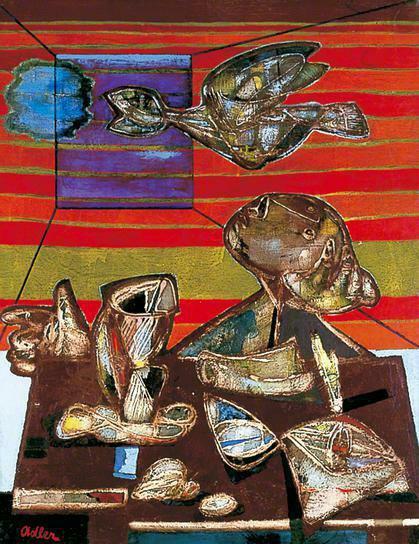 In fact, it appears he shot himself in the head on a hill outside Taxco in 1959 during one the bi-polar episodes that plagued, not just Paalen, but many other surrealists of his vintage throughout his life: a rich and heady initiation indeed into the artists’ world for the 15 years old coal miner’s son from Biddulph. 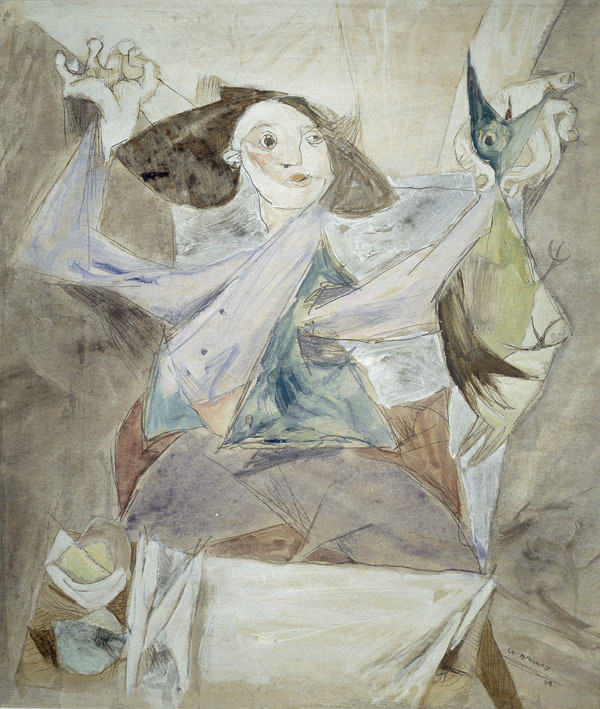 John showed me the work of Victor Brauner whose imagination had also been set aflame in Mexico, the Cuban Wilfredo Lam and the English woman surrealist and Ernst’s former lover and muse Leonora Carrington, whom I met in 1968 in Mexico city where my own work was first exhibited at the Instituto Anglo-Mexicano De Cultura. John Shelton was an interesting mixture the tough, almost brutal taskmaster and benign, fatherly mentor who sowed the seeds for me to develop into what he called a “heavyweight” rather than a mere “bantamweight”. Indeed, like a boxing coach who goads the promising pugilist to reach far beyond himself John Shelton prodded, provoked and cajoled me, making it clear he was not at all interested in the verbally stated ideas and intentions of his followers but in what they actually produced. “Show me, then talk” was his axiom. On reflection I understood later that this was a continuation of the mentoring he had received as a young painter from the two Roberts and Adler: a blend of uncompromising, sometimes brutal honesty and candor cadenced with the sincere wish to nourish the seeds of an uncompromising, high voltage form of creativity and see them grow and mature into something splendid. Having emulated John Shelton and the two Roberts (Colquhoun and MacBryde), Jankel Adler and others, unlike these London based painters of the 40’s and 50’s I went on to meander, not the streets of Soho but the world, setting up my first studio in Mexico, then San Francisco in 1970 and on to Africa, Sri Lanka, the Philippines, Jakarta and now Bali. I absorbed influences and inspiration from all these places and cultures so very far from my own geographical roots. These by now deeply digested influences, mixed with a hundred other ingredients including an early obsession with Buddhism, Eastern philosophies and psychologies, Freud, Jungian psychoanalysis, Melanie Klein’s ‘object relations psychology’ with reference to the origins of fantasy and on and on the list goes. All this, plus much more led to the development of a visual syntax that is thoroughly international and archetypal, perhaps universal even in content, form and meaning. Yet after processing this plethora of experiences that have impacted and mediated my own particular creative nexus and character over the course of more than five decades I find my thoughts returning to those potent early heroes of John Shelton’s youth and subequently my own early beginnings. 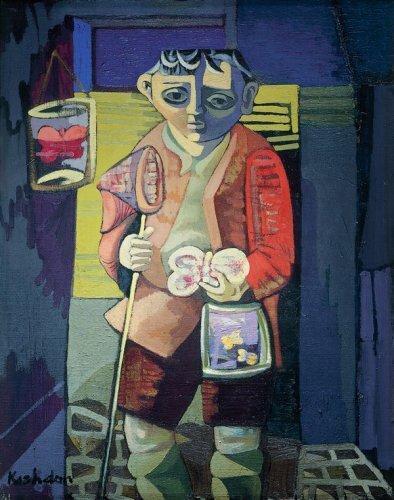 Men such as Robert Colquhoun and Robert McBride, Jankel Adler, Graham Sutherland, Alan Davie, Francis Bacon and the poet George Barker. Constant tensions between colour and texture, forms and references. Colour – So much brown! But the landscapes and portraits too, even in the skin tones, appear predominantly brown. 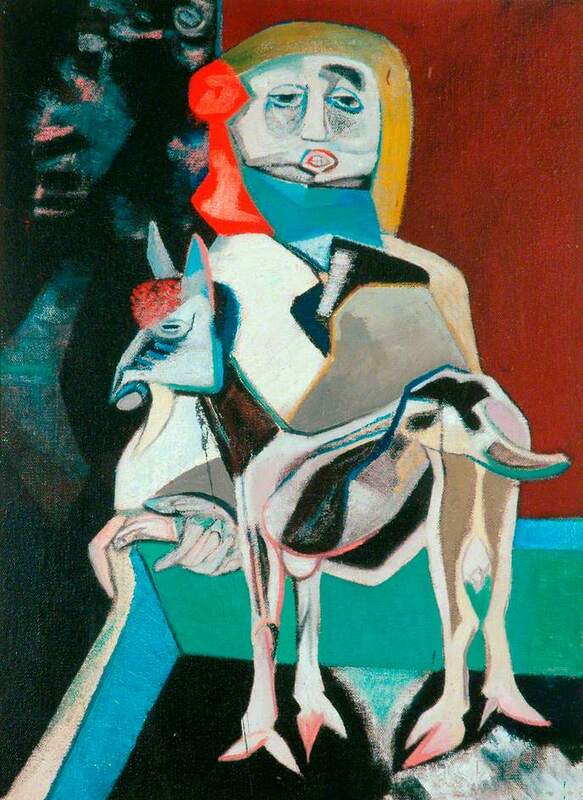 Seems regressive – the dull cubist palette of Picasso & Braque. But his colour cheers up a bit once he is released from the internment camp! Forms – Constructivist? How much chance? What laws do his compositions obey? Any? In the collages the upside-down elements (writing, images) are sometimes quite dominant. 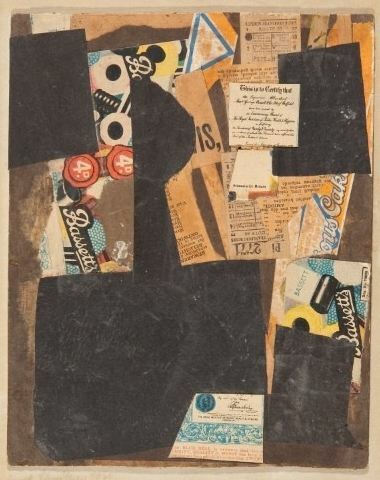 Did Schwitters work both/all ways up until the final resolution? The later paintings and small sculptures move towards a more lyrical, clean, hard edged colourfulness, lose their grubbiness, even take on a strange hint of style. But this threat of taste is always carefully recuperated by some element or small fragment of anti-taste. Allure, then deflection. A sideways step. 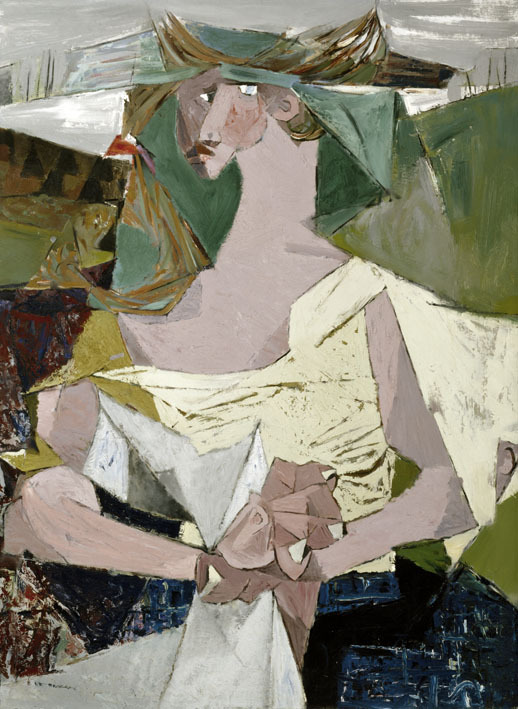 In Untitled (Lovely Portrait), 1942, Schwitters paints over an existing Victorian portrait, leaving only the face from the original. 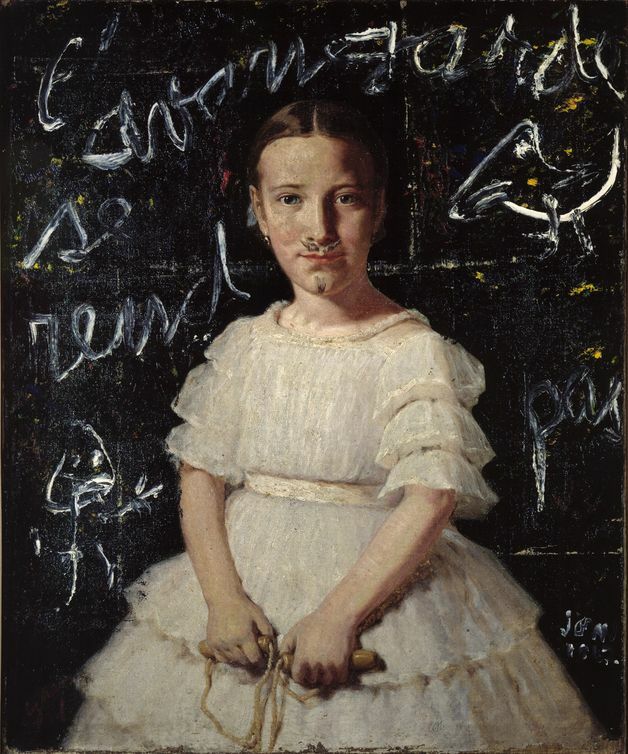 See Asger Jorn’s interventions (“defigurations”). 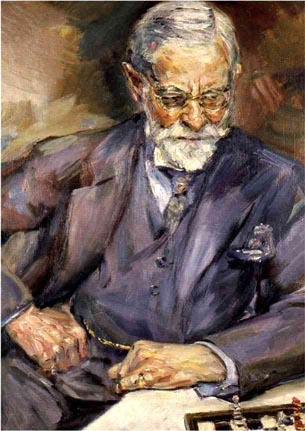 But unlike Jorn, Schwitters did not disrespect the original, given that he was a conventional portraitist himself. 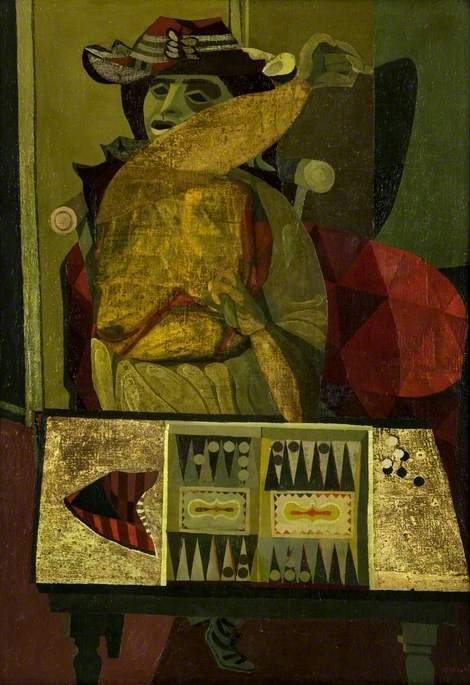 See also Joyce Cary’s Gully Jimson (The Horse’s Mouth) buying an old Rembrandt to paint over in place of a new canvas. Also, Duchamp’s “anti-readymade” notion of using a Rembrandt as an ironing board – though that works only as an idea, not as an object. The portrait painted over by Schwitters as an anti-readymade? Before I viewed this show, I thought that I understood Schwitters’s work. Now I find that I don’t. But I like it all the more for that. 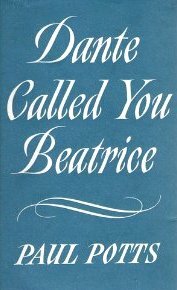 Just caught up with the 1960 autobiographic collection, Dante Called You Beatrice, by the trenchcoat-wearing, tyewriter-stealing, broadsheet-hawking People’s Poet, the penniless Paul Potts. My 1961 copy is a book club edition; extraordinary that Potts went in one move from utter obscurity to Readers Union choice of the month. Included are very readable short pieces on painters Robert MacBryde and Jankel Adler, which I’ve added to the Two Roberts page – the MacBryde bit at the very top and the Adler bit at the very bottom, so easy to find. Potts may have been a dodgy poet, but he wrote wonderful prose. Rather than advancing in steps by argument, his mind seems to have hammered out his world in aphorisms, so that every sentence has the quotability of a punch line. To save my summarising Dante, there’s a nicely readable appreciation of it here by Robert Latona – recommended. And Potts on George Barker is still here. 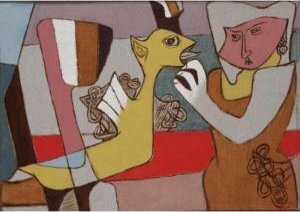 My lengthy page on the Two Roberts, painters Colquhoun and MacBryde, has been rounded off (for the time being) with a short thought on their mentor, the exiled Polish painter Jankel Adler. The Roberts are said to have borrowed much from Adler, so it’s hardly fair to peg him as their follower. Though I wonder if the borrowing wasn’t more two way? 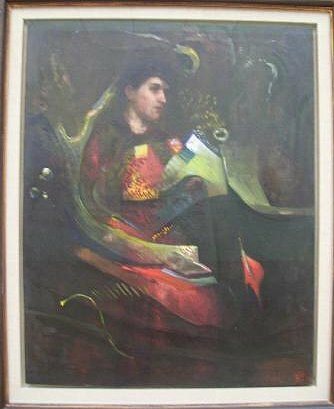 I know very little about Adler’s work, but I am struck by the way that his painting techniques at this time seem to have borrowed from the experimental processes of etching he would have encountered during his collaboration with S W Hayter in Paris. Anyway, use the Colquhoun and MacBryde tab at the top or click here if you’re interested, and then scroll way, way down. The paintings are sumptuous. But it’s his earlier career that links to the Roberts. And wonderful paintings they are, too. Forget crop circles: this is the real stuff. 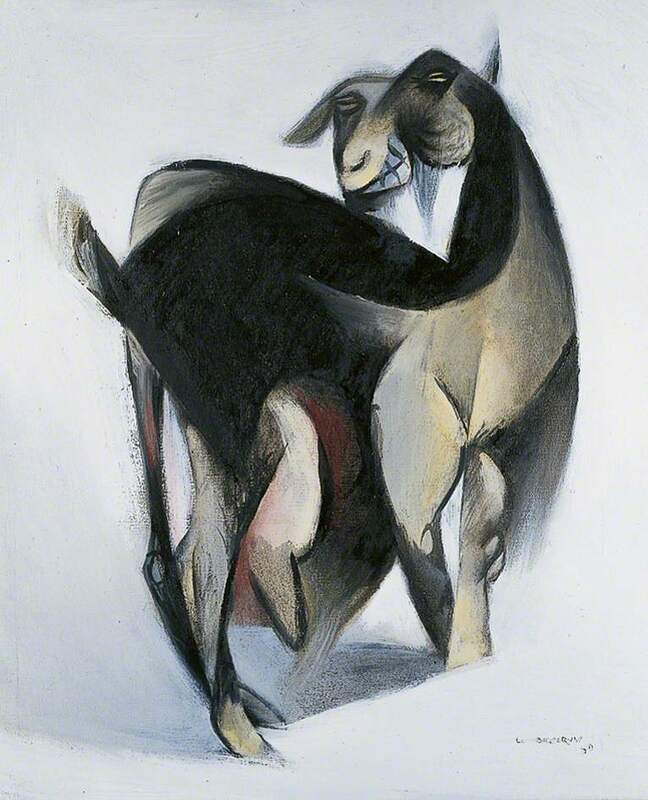 My page on the Two Roberts, painters Colquhoun and MacBryde, has been further embellished by a note on John Kashdan, the man who put the monotype in British modernism, a fine painter, and one whose work shared much, in both style and content, with that of the Dynamic Duo. Click here for the page, or use the tab up top, but you’ll need to scroll way down. The more I look at this, the more it seems that the circle of the Roberts in reality constituted something of a post-war movement, distinctively British but informed by European modernism and quite apart from the more literary neo-romanticism of Michael Ayrton etc, that might under other circumstances have challenged and withstood the tide of abstract expressionism.